it has an internal energy source that enables it to release 3 times more energy than it receives from the Sun. However, smaller and less massive than Jupiter and with approximately the same density as wood, Saturn is by far the lightest planet in the solar system. 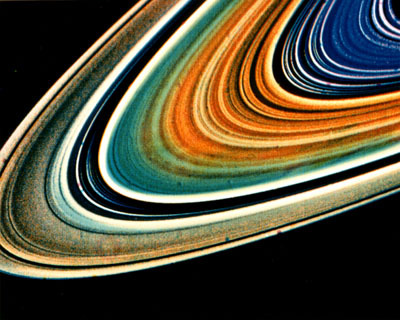 Saturn’s ring system, some 300,000 kilometres across but less than 1 kilometre thick, consists of thousands of very narrow rings of more or less densely packed solid matter. These vast quantities of solid debris, ranging from tiny dust particles to huge chunks of rock and ice spanning several hundred metres, constantly float above the planet’s equator. While most of Saturn’s 30 natural satellites are frozen and pitted with craters, Titan stands out as the only satellite in our solar system with a dense atmosphere and organic matter. Scientists see it as a sort of frozen, primitive Earth that may help us understand how life emerged on our planet. Etymology: Saturn was the Roman god of farming and agriculture, corresponding to the Greek god of time Cronos. Distinctive feature: Saturn’s extremely low density makes it light enough to float in the sea... assuming a big enough sea could be found! Typical one-way journey time using current technologies: 4 to 7 years.